Tangy with a bit of spice, Red Pepper Walnut Dip is flavorful deliciousness! 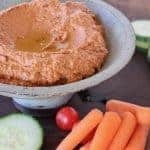 Toss it, spread it, dollop it, this vegetarian dip is simply, healthy food. Peppers: Roast the peppers. If using a grill, set the peppers directly on the grill. Roast until skin is puffed, blistered and blackened, turn peppers during roasting so all sides are on one side. Remove from heat, immediately place in a large bowl and cover with plastic wrap. Allow to cool at least 15 minutes. This creates steam which allows the peppers to be easily peeled. Remove peppers from bowl, peel off charred skin, remove stem and seeds. Meanwhile: heat oven to 350 F. Place walnuts on baking sheet and toast for 12-15 minutes. Set aside. Dip: In food processor or blender, combine red peppers, walnuts, bread crumbs, pomegranate molasses, lemon juice, garlic, paprika, cumin, chile flakes, salt and 2 tablespoons olive oil. Process until smooth. Pour into bowl, drizzle with 1/2 teaspoon olive oil. Dip can be served or stored up to a week. Find pomegranate molasses in the middle eastern section of the grocery store. Jarred roasted peppers may be use in place of fresh roasted peppers. Just drain them first.